When the news of marine phytoplankton hit the market, a lot of health conscious individuals that are either on chlorella and spirulina suddenly decided to make the shift. If many scientists have regard those two algae life forms to be super foods, what more can one say about the marine phytoplankton that are regarded to be a much purer and more nutrition dense food supplement? Marine phytoplankton feeds almost all sea animals, which is very unlike chlorella and spirulina that no animals feed on. That’s the main reason why marine phytoplankton was regarded to be the ultimate super food. However, the many claims of Ocean’s Alive Marine Phytoplankton prove to be untrue. Thus, they are regarded as a scam. Needless to say, the Ocean’s Alive Marine Phytoplankton scam has changed a lot of people’s views about this high potential super food. However, most of what was claimed to be marine phytoplankton’s nutritional benefits is true. What’s actually faulty is the way that Ocean’s marketed their products. They claim that their product is live marine phytoplankton when it’s really not. As much as they want the phytoplankton to be alive, these microorganisms can’t sustain life inside a small bottle that has been sealed and stored for a long time. Furthermore, the water in which the phytoplankton was drenched on is said to be seawater. If that is the case, then it is not good for the health. Nobody drinks seawater for obvious reasons, even if it is as pure as the ones obtained under the deepest part of the ocean. And since seawater has a very high concentration of salt, taking a drop or two of such substance can be very detrimental to the health in the long run. There are many other details that could prove the Ocean’s Alive Marine Phytoplankton scam. 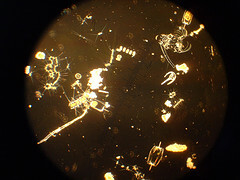 One detail is about the content of the live phytoplankton to be lower than the dried or dead ones. Also, some parties say that they are not following strict quality control in their plant’s manufacturing process. Some claim that they’re using old and substandard materials in their products. All of these are very clear indications that the company is merely after the consumer’s money and has no regard as to how useful and authentic their products should be. The Ocean’s Alive Marine Phytoplankton scam should serve as a reminder to the public for them to be very wary about the health supplements that they’re buying and using.